Before we moved to Oman Brad was on a conference call about his new project. 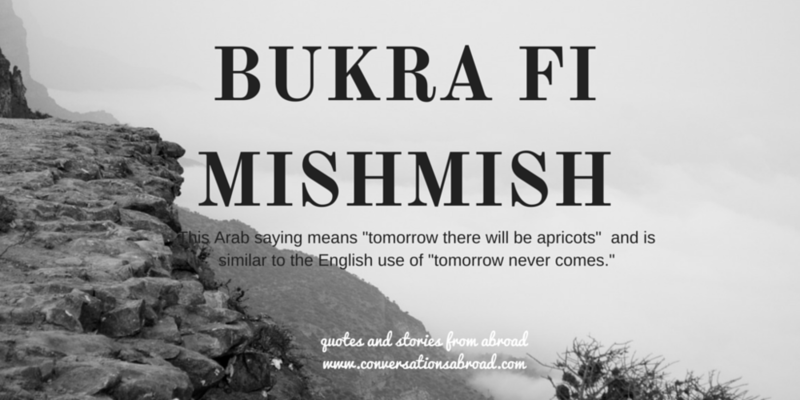 On the call someone said, "Don't worry, bukra fi mishmish." Confused, Brad replied, "Excuse me, what does that mean?" and was told, "Ya know, tomorrow there will be apricots." Somehow this was obvious to everyone else on the call. When he came home and told me this story I said, "Do we want apricots?" I was quite confused. He taught me that the term is similar to our use of "Tomorrow never comes," or "When pigs fly" and is used when the impossible is mentioned. A year ago I didn't even know this phrase, but now I use it without thinking. P.S. I recently searched this term and found a song by Heartbeat with this title. Here's to hoping that peace will come.